Director – Jonathan Newman, Screenplay – Matthew Huffman & Christian Taylor, Based on the Novel Mariah Mundi and the Midas Boxby G.P. Taylor, Producers – Peter Bevan, Iban Cormenzana, Ignasi Estape & Karl Richards, Photography – Unax Mendia, Music – Fernando Velazquez, Visual Effects Supervisor – Jonathan Cheetham, Visual Effects – uFX, Special Effects Supervisor – Nick Rideout, Makeup Design – Pamela Haddock, Prosthetic Makeup Design – Matthew Smith, Production Design – James Lewis. Production Company – Entertainment Motion Pictures/Arcadia Motion Pictures/Telefonica Producciones/The Kraken Films/Cronos Entertainment/Nix Films/Afrodita Audiovisual/Ufilm/Matador Pictures/International Pictures Two/Cinema 4/120 db Films/Ufund. London, 1885. Teenager Mariah Mundi and his younger brother Felix are at the museum where their father works when Mariah encounters a stranger, Will Charity, who collapses wounded. Their parents come running and Charity whispers something of great urgency to their mother. Afterwards, she slips two halves of an amulet that Charity has given to her into either boy’s pocket and tells them to seek safety. The parents are then captured by the thugs of industrialist Otto Luger. The boys are forced to flee, only to be apprehended by police and sent to the reformatory. They are rescued by Charity who tells them how he and their parents work for the Bureau of Antiquities and are seeking the whereabouts of the legendary Midas Box that is reputed to be able to turn things to gold. Felix is snatched by Luger’s thugs. Charity gives Mariah fake papers and tells him to go to Luger’s Prince Regent hotel on an offshore island posing as a porter. There Mariah, joined in his quest by the maid Sacha, searches the hotel’s secret passageways for Felix and his parents, as well as the whereabouts of the Midas Box, which he discovers has the potential to be used as both a force of healing and a deadly weapon. The Adventurer: The Curse of the Midas Box is yet another 2000s/10s attempt to launch a film franchise developed from a Young Adult series of books. Outside of hits like the Harry Potter series, the Twilight films and The Hunger Games series, the majority of these burgeoning Young Adult adapted series have not been successful enough to make it beyond a single film, as witness the likes of other never-ran series such as The Golden Compass (2007), The Seeker: The Dark is Rising (2007), Cirque du Freak: The Vampire’s Assistant (2009), I Am Number Four (2011), Beautiful Creatures (2013), The Mortal Instruments: City of Bones (2013), The Giver (2014), Vampire Academy (2014), Fallen (2016), The 5th Wave (2016), Maximum Ride (2016) and Mortal Engines (2018). The Adventurer is a British attempt to create another such series, although it flopped miserably, earning only around $5000 in theatrical release in the US. The Adventurer: The Curse of the Midas Box is based on the Young Adult novel Mariah Mundi and the Midas Box (2007) by G.P. Taylor, a former Anglican vicar. Taylor wrote a trilogy of Mariah Mundi novels and this is followed by Mariah Mundi and the Ghost Diamonds (2008) and Mariah Mundi and the Ship of Fools (2009). Taylor has also written Shadowmancer (2002) and sequels as a rebuttal to the atheist fantasy of Philip Pullman, while he is credited as co-writer on the sf film Scintilla/The Hybrid (2014). I liked the premise that The Curse of the Midas Box was sold with – an Indiana Jones type adventure set in Victorian England. On the other hand, for about the film’s first half-hour with the various running around evading pursuers, imprisonment in orphanages and a couple of lacklustre action sequences, the film fails to seem like it is doing a terribly enthusiastic job of this. That said, the film improves considerably once it gets to the island and the principal location of the hotel. There it creates something reasonable out of all the lurking around the secret passageways and underground tunnels, the cryptic clues, elaborate disguises, possible sea monsters lurking around the island, thugs with mystical goggles and augury via mystic sets of cards. It is where you feel the film is coming into its own as a Victorian adventure with an emphasis on the mystery element, even if Jonathan Newman’s direction never pushes the material and makes it open up and soar the way an adventure film should. Top-billed Michael Sheen has been cast as the adventurer hero but gives a performance that is so manically perky that he fails in any way to seem like a tough and grizzled Indiana Jones adventurer type. (At least, one presumes Sheen is the titular adventurer, the film is now named the eponymous The Adventurer as opposed to after the book’s hero Mariah Mundi but it is never clear who this is referring to). Sheen’s performance becomes even more bizarre when he starts playing the role of the escapologist/magician The Great Bizmillah in an outrageously fake Indian accent, even aside from the fact it feels like a racial caricature out of a 1950s boy’s adventure story. There is also Sam Neill as the villain of the show where Neill plays broadly and seems on the verge of camping the part up. 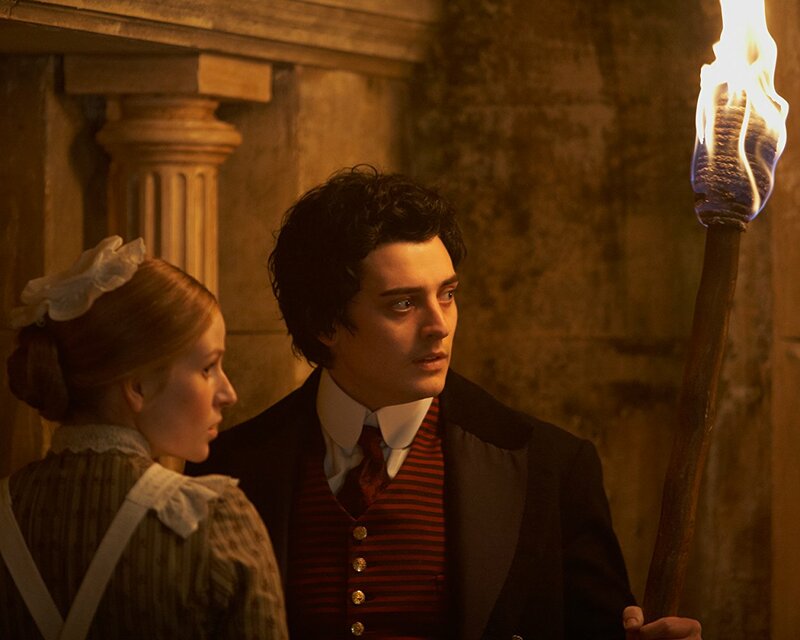 Young Welsh actor Aneurin Barnard, who one last saw as the traumatised parent in Citadel (2012), makes for an unlikely teenage hero with gawky mop top of hair and fails to much comes to life in his performance.